This help article is for our Budget Template version 1.0. As of May 17, 2018 we have released the version 2.0 of this template, which you can learn about here. Version 2.0 of this template automatically creates and archives budget periods for you! The Budget History sheet is where the budget data is stored when you archive a budget from the Budget sheet. A budget history entry is created for each category that is visible on the Budget sheet at the time the budget is archived. By default, the Budget History sheet is hidden. 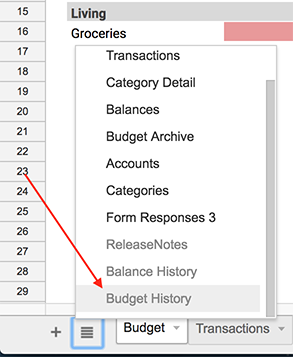 You can unhide it by clicking the four lines in the lower left corner of your sheet and selecting Budget History. The name given to the budget when it’s saved from the Budget sheet. The date the budget was saved. The group assigned to the category at the time the budget was saved. A category visible on the Budget sheet at the time the budget was saved. The category’s type, which can be income, expense, or transfer. The sum of all transactions marked with the category for the period selected on the Budget sheet at the time the budget was saved. The budgeted amount for the category on the Budget sheet at the time the budget was saved. The period selection for the budget at the time the budget was saved, which includes weekly, bi-monthly, monthly, quarterly, or custom. The period start date for the budget at the time the budget was saved. The period end date for the budget at the time the budget was saved.